I attended the Second Annual Soil Health Day with the Trace and Save team. It was very insightful, and a good reminder of farming practices which are beneficial to the soil, crops and pastures. The theme of the conference was centred around regenerative agriculture, which is a farming method aimed at restoring soil, reducing erosion, increasing soil carbon levels, enhancing biodiversity, improving water cycling, enhancing ecosystem services and generally restoring and improving the health of the entire agroecosystem (Read the blog: What if agriculture could actually have a positive impact? for more information). Regenerative agriculture is what the Trace and Save system aims to achieve. Many of the speakers had a common approach to regenerative agriculture, which is to improve soil health through increasing carbon and enhancing soil life that will result in healthier crops and pastures. I have seen evidence of how soils have improved from adopting this approach over the past 5 years. 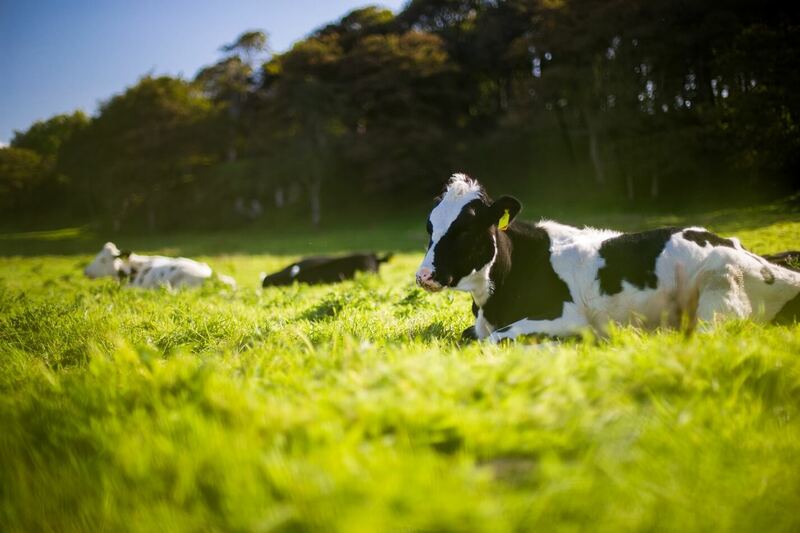 The quality of grass that dairy farmers produced also improved significantly. In this blog I am going to explore how this approach to farming actually works, based on the idea of happy soil life, happy grass, happy cow. I see this approach as a continuous cycle from the soil to the grass, to the cow, and back to the soil. The focus should first be on improving the soil life, which improves soil health, resulting in healthier crops and pastures, and ultimately a happy cow. So let’s start with the soil, which is the home of the soil life. One of the speakers, Jay Fuhrer, mentioned how soil life is similar to human life. In order to live a happy and functioning life one needs to have a place of rest and peace (a home) where you can fulfil your basic needs such as eating, sleeping and socialising. Soil life is affected by the environment in which they make their home. Soil life uses organic matter as a food source. Carbon is broken down to sugars and starches to gain energy. This energy is the basis of a healthy, functioning soil food web. That is why carbon makes soil life happy. Soil life is also beneficial to ecosystem processes, such as storing and cycling of nutrients. As the organisms interact with one another, and with plants, they make nutrients available. When the soil organisms die they also release nutrients back to the soil, which were previously unavailable to plants. An example of this is when organic nitrogen is converted into plant available inorganic nitrogen. When the soil life is happy and functioning there is therefore no longer the need for excessive chemical nitrogen fertiliser. This will save farmers money as the soil life is providing nutrients to the crops and pastures, rather than having to buy fertiliser. The overall health of the soil is improved through the stimulation of soil life that performs natural processes, which further results in healthy, happy grass. Many animals rely on healthy grass to make up the bulk of their diet. Animals are very similar to soil life and human life; they also need a healthy environment in which they can eat, sleep and interact. Fortunately such an environment can be created by reducing external inputs. A reduction in external inputs leads to a healthier environment that produces healthier grass. Animals in this environment are less exposed to chemicals such as fertilisers, herbicides and pesticides. This makes the animals much healthier and happier. A healthier and happier animal will improve production at a lower cost to the farmer. In order to stay in business and keep on farming indefinitely in the future, without harming the environment, a healthy system should be built that can produce more at a lower cost. I believe this can be achieved using regenerative agricultural practices.